Six medals including two titles: another great day for Europe’s classy aquatics athletes in three disciplines. The golds came in the men’s marathon swimming, courtesy of Netherlands’s Ferry Weertman and in synchro, where Russia’s Natalia Ishchenko and Svetlana Romashina retained their duet title. 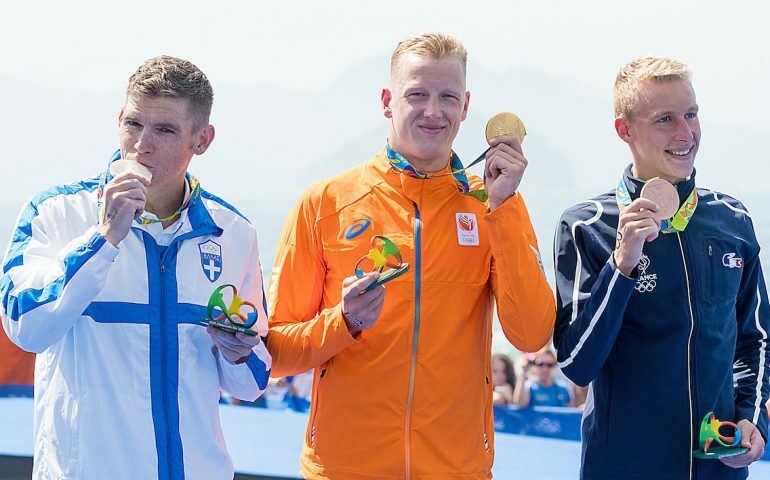 The Netherlands doubled down the Olympic marathon swimming titles: after Sharon van Rouwendaal’s triumph a day ago, Ferry Weertman came first among the men in perhaps the closest finish ever in open water swimming history. It was a European 1-2-3, which was almost 1-2-3-3 but, as another similarity with the women’s race, a medallist was disqualified after the competition had concluded. Britain’s Jack Burnell lost his bronze as he received a second yellow flag in the finish where, at first, nothing separated him from France’s Marc-Antoine Olivier. Ahead of them, Greece’s Spyridon Gianniotis seemed to be the winner but he missed to reach the touchpad on first intention and Weertman, arriving neck-to-neck with the veteran Greek legend, was quicker by some hundredth. On the official scoring sheet their recorded times are the same but reviewing the photo finish, Weertman was declared the winner. The second gold of the day went to Russia. Well, it was somewhat inevitable that the synchro duet final would see another triumph of Natalia Ishchenko and Svetlana Romashina. The title-holders never lost a major competition and they were once more superior to their greatest challengers, the Chinese and the Japanese duets. Less than 1.5 point separated the 3rd from the 5th, but the Ukrainians and Spaniards couldn’t catch up the bronze medal winning Japanese. Two more medals came in the neighbouring diving pool where Britain’s Jack Laugher offered one of his best performances and German Patrick Hausding also did a fantastic job to reach the podium in the 3m springboard event. Laugher barely made the final, slipped in as 12th placed in the semis which forced him to dive first in each round. However, he successfully put the others under pressure as he offered a series of wonderful attempts – though credits go to eventual winner Cao Yuan, as the Chinese responded well to the Briton’s challenge. All three medal-winners’ produced almost flawless forward 4-1/2 somersaults, the most difficult dive of their respective programmes. Laugher and Cao got 96.90, while Hausding earned 98.80, the best individual effort in the evening. In men’s water polo, a European podium is guaranteed as the same four sides advanced from the quarterfinals as four years ago in London: Serbia, Montenegro, Croatia and Italy. The Serbs showed they were on track to regain their top form while beating Spain 10-7, Croatia enjoyed an easy cruise (10-6) against the host Brazilians and Italy was superior in all aspects of the game while defeating Greece (9-5). Only the first match was a real thriller: Montenegro left the Hungarians stranded in the first half, leading 4-1 and 5-2 in the second and still 8-6 before the last period, but the Magyars staged a heroic comeback. They levelled the score 71 seconds from time (9-9), so it came down to the penalties but the Montenegrins prevailed there (4-2) and reached the semis for the third time in succession since they first appeared in the Games in 2008.